25 October 2010, at 9:14a.m. UK - Eddie Hegarty, partner in the country's best known gosling hatchery Norfolk Geese, has been elected chairman of British Goose Producers (BGP). Mr Hegarty took over from Judy Goodman at the group's annual meeting hosted by the Goodman family at their Great Witley farm near Worcester. She has been chairman for the past four years and has played a prominent role in BGP activities for more than 10 years. Mr Hegarty, who has been vice chairman, said Judy Goodman had been a 'tremendous tower of strength' who had worked tirelessly to promote the goose sector and to make its voice heard at the British Poultry Council. Further praise for her contribution came from John Reed, recently elected BPC chairman, who said that her sound practical approach and promotional zeal at food events and through the media had served the sector well for many years. Commenting on the growth of her own goose production, he said that as with some other poultry businesses, what had started as a hobby had grown to the success it enjoys today. The new vice chairman is John Franklin, a BGP council member for many years, who rears geese and a range of free range poultry at Thorncote Green, Sandy, Bedfordshire, for sale through the farm shop and 14 farmers' markets. Around 70 BGP members and guests took part in the visit which included a tour of the farm where Judy and Geoff Goodman and their sons, Andrew and Mike, rear around 4,200 geese and more than 4,000 free range bronze turkeys mainly for Christmas. A video filmed last Christmas showed how their geese, and also turkeys, are processed and prepared for market. 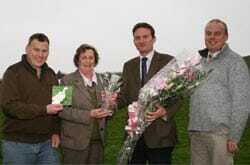 During the event, Mr Hegarty presented the John Adlard Memorial Award to new goose producers, brother and sister, William and Lucy Weaver, of Perrinpit Farm, Frampton Cotterell, Gloucestershire. They have introduced geese this year as their own 'JollyGoose' venture on the 500-acre mixed family farm. 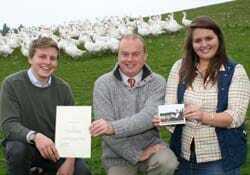 Members of Sodbury Vale Young Farmers Club, they are rearing 30 geese this autumn. "We've a friend who has started producing Christmas turkeys and we thought we'd go for geese so as not to compete," said William. The award, which includes a donation of goslings and specialist support through the first year, is made annually to encourage new goose producers, commemorating the BGP founder chairman, John Adlard, who led the revival of the goose sector through more than two decades until his death in 2005.